In detail, the air source heat pump extracts heat from the outside air in the same way that a fridge extracts heat from its inside. It can get heat from the air even when the temperature is as low as -15° C. Heat pumps do need some electricity to run, but the heat they extract from the ground, air, or water is constantly being renewed naturally. How noisy is an air source heat pump? We recommend the Samsung Mono unit in most situations. It produces 53dB of noise during its maximum output. In a properly designed system the heat pump will rarely run at maximum but even when it does, as long as it has been correctly sited, it won’t be heard inside of the property, . 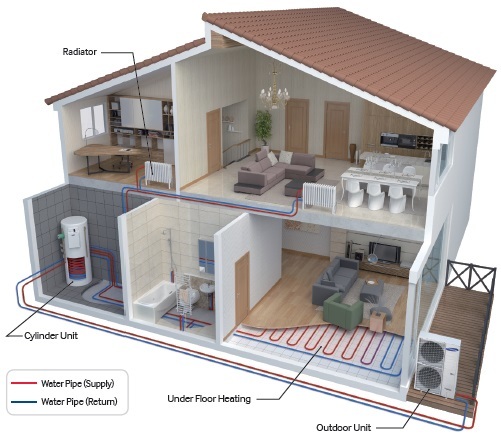 Can an air source heat pump provide 100% of my hot water and heating? Yes, provided the heat loss has been calculated correctly and heat emitters are sized at the lower running temperature the system will provide 100% of the hot water and heating. Once per week the Heat Pump will use an electric heating element to raise the temperature of the water in the system to 65ºC to ensure that any potential bacteria in the system is killed off, this process is called pasteurisation and only uses a very limited amount of electricity. 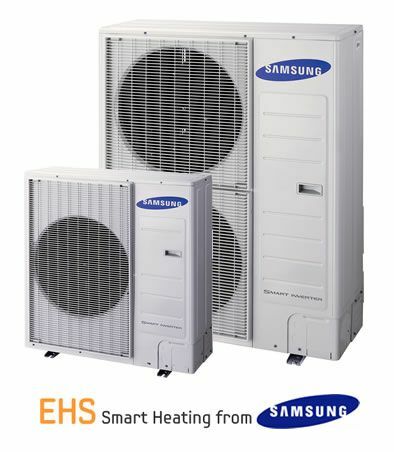 Air Source Heat Pumps look similar to an Air Conditioning unit, and come in various sizes. The normal size for domestic properties is 1m x 1m x 0.35m.